If you are learning how to make lemon pie recipes, the base for one can be made with many different ingredients. This is due to the fact that the light flavor of lemon is able to blend so well with other flavors. Although the most popular base “or crust” is a simple pastry dough, there are many other types. Graham cracker crusts, chocolate cookie crusts or other cookie crusts are also very common to use with lemon. Lady fingers are sometimes used as a crust for no bake dessert pies and the taste is really good. 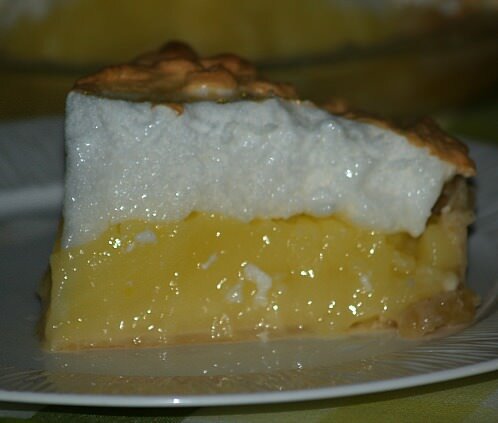 Even baked meringue can be used for a crust to make lemon pie. Next, and probably the most important, is the filling. When learning how to make lemon pie recipes, what type of filling do you want to achieve. Do you want a heavy filling or a light and airy one? Do you favor lemon pies that are creamy? This texture comes about by the ingredients used. Creamy lemon pies get their creaminess from using ingredients like milk, cream, sour cream or cream cheese. Most cream pies are heavier in texture except when beating heavy cream until light, airy and stiff. To accomplish a lemon flavor in your pie, you can use lemon juice, either bottled or fresh squeezed. As you learn how to make lemon pie recipes you will find many recommending lemon flavor, lemon extract, lemonade, grated lemon peel and even prepackaged lemon pudding mix. I never use lemon flavor; I simply do not like the taste in my recipes. If at all possible, I will use fresh lemon juice instead of the bottled juice. I do like the taste of grated lemon peel in many of my recipes, not just pies but also in others. Seldom do I use lemonade. Most of the time I will use a combination of two or three like fresh lemon juice, grated lemon peel or lemon extract. NOTE: After squeezing the juice from lemons, I put the rinds in a plastic bag and freeze for the grated peel in case I run out of fresh lemons. 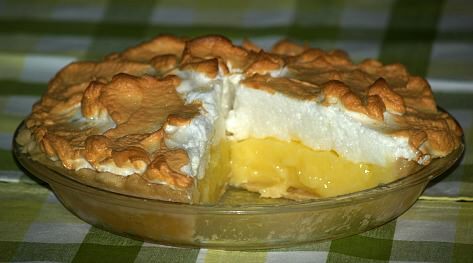 Most lemon pie fillings are thickened with one or more “thickening” ingredients. This could be gelatin, egg yolks, flour, cornstarch or commonly a combination. The cornstarch is one which I wish to address because if not measured correctly, it can be a problem. Thickening ingredients should be balanced with the other ingredients. Most recipes have already done this but you must follow it and measure correctly. This means to fill the spoon and level off with a flat knife. Too much cornstarch will make the filling tough. Too little cornstarch will not allow it to set up and when you cut a piece, it will run. After you learn how to make lemon pie recipes, you will decide how you like to serve it. You really do not have to put any kind of topping on your pie. It will taste delicious simply with crust and filling. Personally, I love the meringue on lemon pies. Of course, if you make a dessert pie, you cannot put it in the oven to brown. In this case, stiffly whipped cream makes a perfect topping. Ground nuts, shredded coconut or graham cracker crumbs also make easy toppings. The first recipe is my favorite. When I learned how to make lemon pie recipes, this was the first that I tried. It has always been my favorite. The filling is made with water instead of any of the creamy ingredients. It is light in texture and has a delicious lemon flavor. Combine in a little bowl the butter, lemon extract and vinegar; set aside. Combine and mix in a medium saucepan the sugar, cornstarch and water. In a bowl combine and mix well the YOLKS and juice; add to saucepan. Over medium to medium low heat cook and stir until thickened about 25 minutes. Remove from heat; stir in the butter, extract and vinegar mixture until butter melts. Let hot mixture stand while beating meringue. TO MAKE MERINGUE on medium speed of mixer beat egg whites and salt until foamy. On high speed gradually beat in sugar 1 tablespoon at a time until stiff peaks form about 4 minutes. 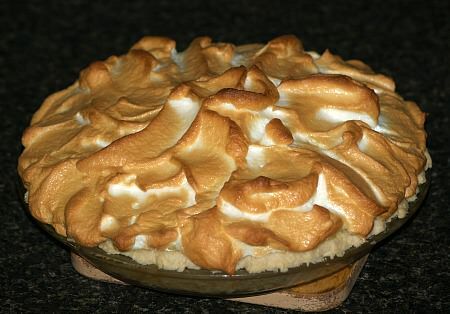 Pour hot lemon mixture into prebaked pie shell; top with meringue. Bake until meringue is lightly browned; cool to room temperature. Refrigerate for several hours until cold before cutting. Use this never fail pie crust as you learn how to make lemon pie recipes. Combine flour, shortening and salt in bowl; cut together until crumbly. Combine egg vinegar and water; stir with fork to mix. Add egg mixture to flour mixture; toss with fork until dough forms. This recipe makes 3 single crusts. Learn how to make lemon pie recipes with easy to prepare products. Combine and mix milk, lemonade and Cool Whip until smooth. Spoon into graham cracker crust; chill at least 3-4 hours before serving. Learn how to make lemon pie recipes with ice cream. Combine crumbs, pecans, apple pie spice and nutmeg. Add butter to mixture stirring until well blended; press in bottom and on sides of 10 inch pie plate. Bake for 7 to 10 minutes; cool to room temperature. In mixing bowl combine lemon juice and condensed milk; stir until thickened and blended. Add ice cream; beat with electric mixer until blended. Pour mixture into prepared crust; refrigerate until firm or freeze. Learn how to make lemon pie recipes with buttermilk. Combine and mix all ingredients together; pour into UNBAKED pie crust. Bake for 10 minutes; REDUCE heat to 350F degrees and bake about 20 to 30 minutes until firm in center. Learn how to make lemon pie recipes like this black bottom with a chocolate filling and a lemon filling. TO MAKE CHOCOLATE FILLING combine melted chocolate chips with eggs and sugar; blend thoroughly and cool. Beat together whipping cream with vanilla until thick; fold into chocolate mixture. Pour mixture into baked pie shell; refrigerate. HOW TO MAKE LEMON FILLING combine cornstarch, lemon peel and salt in a 2 quart saucepan. Gradually stir in water until smooth; set aside. In a bowl beat together yolks and lemon juice until light in color; gradually beat in sugar. Blend yolk mixture into water mixture; over medium heat cook and stir until thick and cool thoroughly. Spoon lemon mixture over chocolate in crust; chill 4 to 6 hours. Garnish with whipped cream and grated lemon peel. Learn how to make lemon pie recipes like this angel pie made in a meringue crust. In top of double boiler beat egg yolks until thick and lemon colored; gradually beat in sugar. Stir lemon juice and grated peel into yolk mixture; cook over simmering water stirring constantly until thickened (5-8 minutes). NOTE: Mixture should mound a little when dropped from spoon. Cool mixture; spread into meringue crust; top with whipped topping. Combine egg whites, cream of tartar, salt and vanilla; beat with mixer until frothy. Gradually add sugar beating on high until stiff peaks form. Spread mixture on bottom and build up sides of greased 9 inch pie plate. Bake for 1 hour until light brown and crisp; cool in pie plate away from drafts. NOTE: Crust may collapse in center but that is OK. Beat whipping cream until stiff; fold in vanilla and sugar. Stir in sour cream; spread over pie leaving 2 inch open circle in center. Garnish with grated lemon peel. Learn how to make lemon pie recipe with cream cheese. Combine in saucepan ¼ cup sugar, cornstarch, water, lemon rind, lemon juice and beaten egg yolks. Add cream cheese and blend well; cool. Beat egg whites until soft peaks form; gradually beat in ¼ cup sugar until stiff peaks form. Fold egg whites into lemon mixture; pour into baked pie shell and refrigerate at least 2 hours. Combine and mix together sugar, cornmeal and flour; add eggs one at a time beating after each. Add milk, butter, lemon juice and lemon rind; mix well. Pour into pie shell; bake for 45 minutes or until it “shimmies” when gently shaking.